Drift Race is a classic Top-Down Racing game that offers arcade-style drift-controls and fast action! You will compete in short races against up to three opponents on curvy tracks filled with power-ups and obstacles. Your racing career starts in a beginner's race of the Bronze League in a sports car that comes straight from the car dealer. Once you got familiar with the steering and won your first races you will be able to spend some of your prize money to upgrade your car and to enter more difficult races that require higher entry fees but also get you a lot more prize money! Complete all races of a league to qualify for a higher league. Replace your street-legal drifter with a faster race car or save up to buy a real super car! Will you make it to the top of the Gold League? 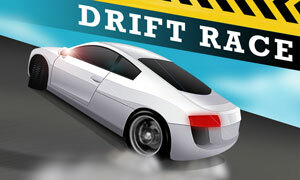 Play Drift Race now for free and enjoy hours of drifting fun!